You have to hand it to Martin McDonagh, the estimable young playwright known for conjuring up primarily darker -- read: violent -- subject matter in his theatrical creations. He’s masterful at building a plotline that is at once both jarring and laugh-out-loud funny. In The Pillowman, he expertly holds the mirror up to himself and his own intensely brutal body of work, taking stock of whether his first duty as a storyteller “is to tell a story” or if it’s to take the blame when such stories are irresponsibly mimicked by those who can’t separate fiction from reality. In Steppenwolf’s staging of this oft-praised play that opened last night in Chicago, director Amy Morton takes the audience headlong into a study of good vs. evil where virtually everyone has blood on their hands, literally. 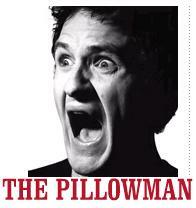 The Pillowman delves into what happens when police in an unnamed totalitarian state suspect a disturbing link between heinous crimes committed against children and an author whose stories are eerily similar. In a police state, is the author -- with the curious name Katurian Katurian Katurian (played with the right mix of indignation and fear by Jim True-Frost) -- culpable merely because he conceived such dark tales or did his stories lead him to physically commit the crimes? Are delivered confessions the result of torture or something even deeper? The Pillowman, as it turns out is not only the name of one of Katurian’s more sympathetic creations who gives comfort to small children on the verge of death, but it also serves as an ample, and ultimately appropriate, metaphor for Katurian himself. As the play progresses through police interrogation, play vignettes within the play and conversations with Katurian’s mentally impaired brother Michal (perfectly played by Michael Shannon), we learn what horrific circumstances from his own childhood lead him to write such macabre fiction in the first place. While this is indeed a grim fairy tale, it is buoyed by brilliant acting and breathtaking direction. In addition to True-Frost and Shannon, there is a delicious good cop/bad cop routine that is ultimately turned on its head by the coupling of the unusually droll Tracy Letts as Tupolski with the explosive Yasen Peyankov as Ariel. Both actors are in top form and ideally suited to their roles. Certainly, this is not a play for the faint of heart, nor is it for one who is easily offended by Christ-like allegories or depictions of evil befalling children. But The Pillowman offers a chillingly candid look into the mirror of one of today’s most accomplished playwrights and tells its audience that even if we don’t approve of what he’s told us, his stories still deserve to be told, particularly since he's so shockingly good at telling them. Which British Hits Will Be Broadway-Bound?